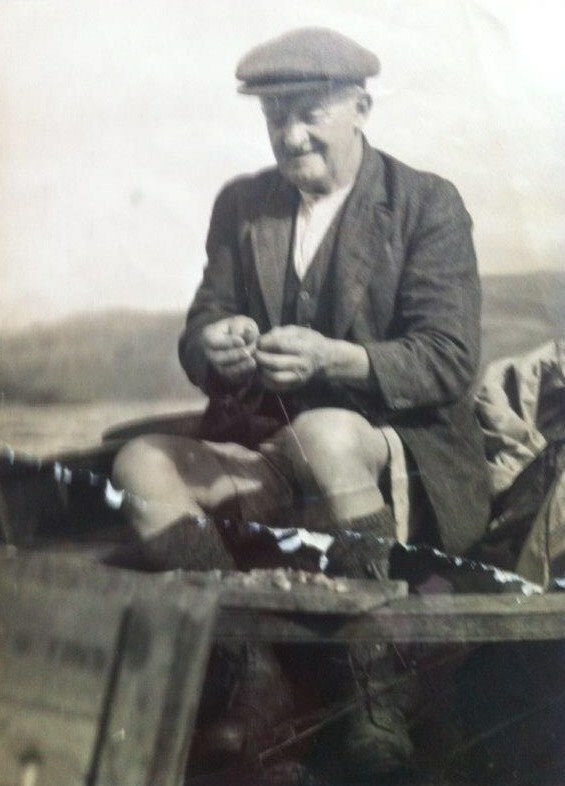 George Urquhart was born on the Isle of Skye on the 28th January 1873. Brought up in a family of ten children, his father was Head Gamekeeper and stalker on the Raasay Estate and later the Balmacara Estate in Wester Ross. 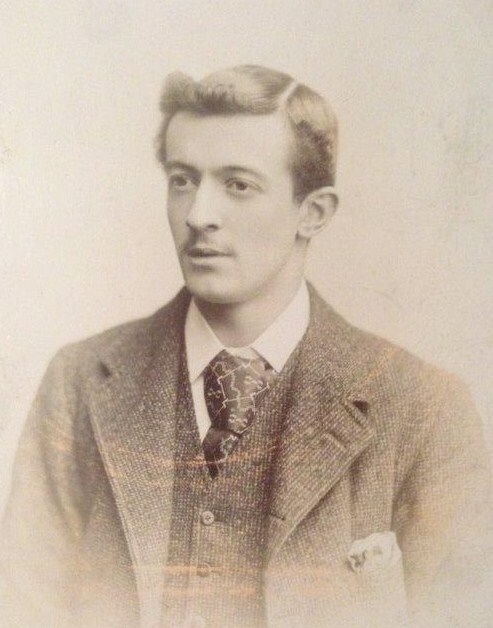 In 1890, aged 16 he ventured south first to Glasgow and then to Sheffield as a trainee manager with the wines and spirits company of Duncan Gilmour. He was to progress with the company for the 33 years in the city. 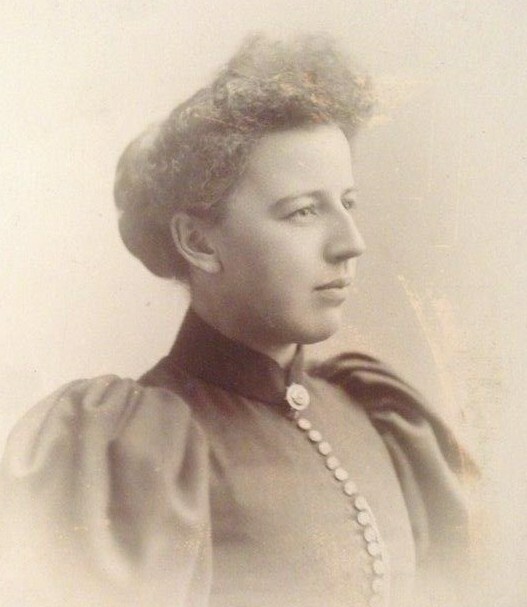 His marriage to Fanny Singleton in their early twenties and the subsequent birth of their four children firmly anchored him to Sheffield in business and community circles alike. 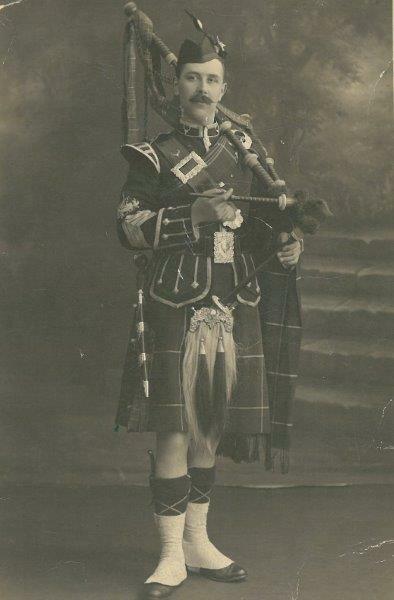 His inherited love of pipe music which he nourished in his family was also pursued within the Caledonian Society and in 1908 the Sheffield Pipe Band was formed. The band grew and spread its influence through the turbulent years, pre and post WW1. A younger George Urquhart (below) with his Sheffield born wife Fanny Reed Urquhart in their early twenties and part of Sheffield’s growing business community. At this time George was managing the Vaults pub near the Castle Market and his wife running their shop in Leader Road Hillsborough. Sheffield’s Coronation pageant on Empire Day 24th May 1906. George with a fellow piper leading young dancers in the Scottish contingent at the Bramall Lane gathering (below). The formation of the band was to follow soon. An undated grouping of Sheffield bandsmen and dancers thought to be early 1930. 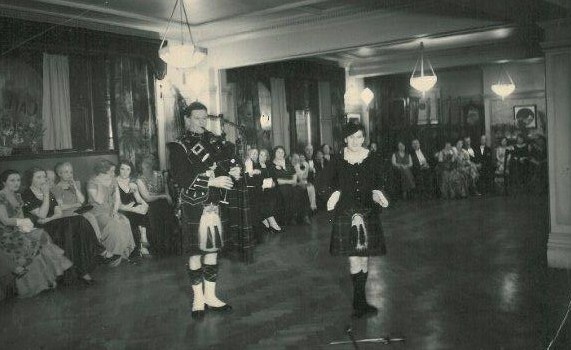 Duncan Urquhart, extreme left with dancer Nan Calder. 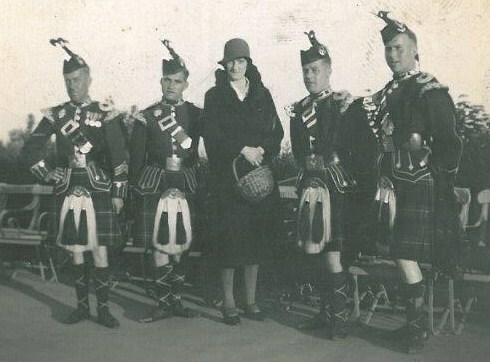 Also, from a much earlier time in the bands development, the three piping Urquharts with admirers. 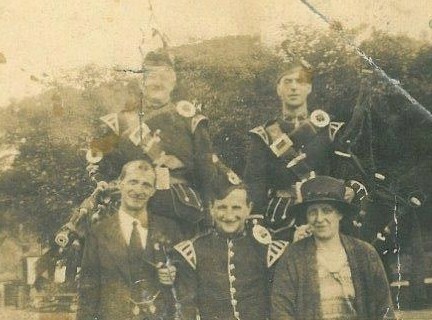 George and Duncan (back row) were close friends but not related but George Urquhart jnr (bottom row) was George’s youngest son and an early band member. 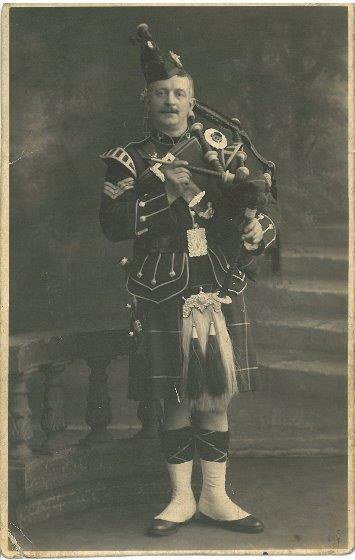 The Sheffield Pipe Band steadily grew between 1908 and the start of WW1 in 1914. 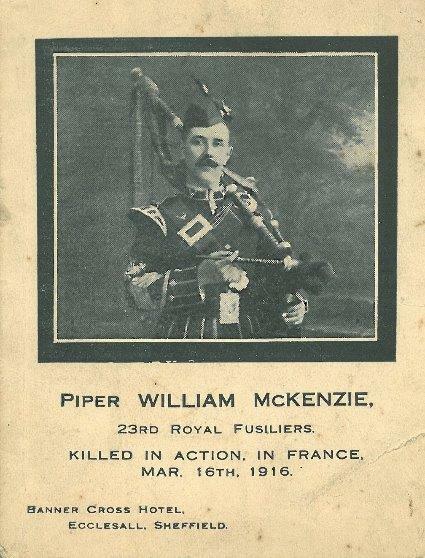 We do not know how wartime Sheffield may have effected its development, but we can record the contribution of one of its pipers, namely William McKenzie. ‘Mac’ was a close personal friend to the Urquhart family and kept up his correspondence from the trenches in a series of brief and sometimes cryptic field post cards. However, on one occasion during a rest from the front line he managed to pencil a nine page letter which survived military census as a nostalgic but cheerful account of life among the ranks and the trenches of Flanders. Click to view letter from Piper McKenzie Family names and familiar references show Mac’s link with Sheffield as a young Scot and proud band member. His letter was to be delivered to the Urquhart family in Sheffield within a couple of weeks of being written, however it arrived two days after him being killed in action. His full dress photo card with its message from the front was also to be the notice of his death to the people of Sheffield. 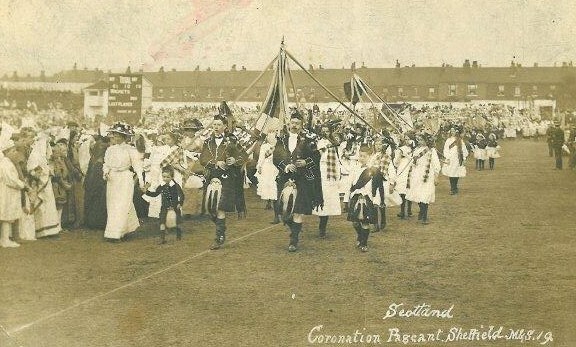 The band continued to thrive through post war years, its pipers, drummers and dancers performing at a widening range of events including Burns dinners etc and also ventured farther afield in the country. 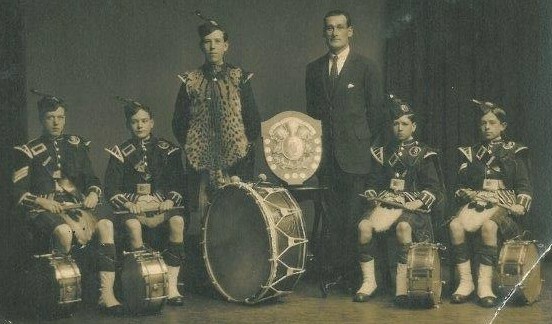 In Cornwall the Polmont War Memorial Boys Band drummers won the Urquhart shield in 1925 and the Cutlers Hall hosted the 1935 Burns dinner of the Sheffield Caledonian Society. 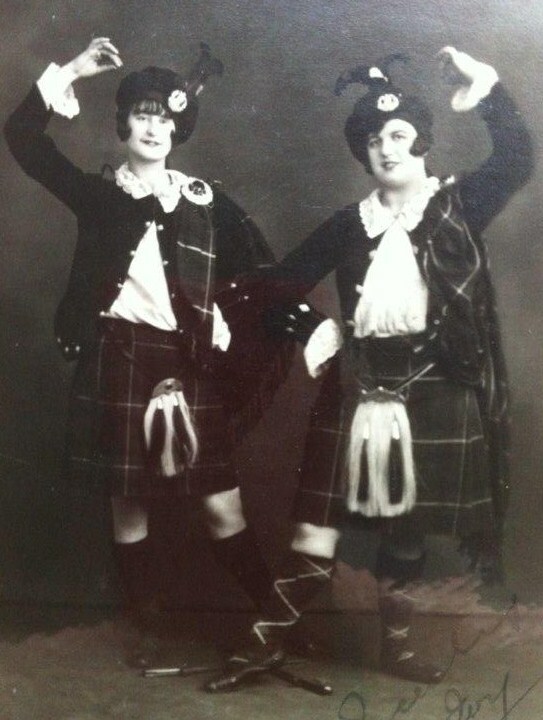 Although we do not have the identity of the piper , we can name the dancer as Nan Calder. Maggie Urquhart (Georges daughter) to the right with Ivy Maxfield are in the lower photo. 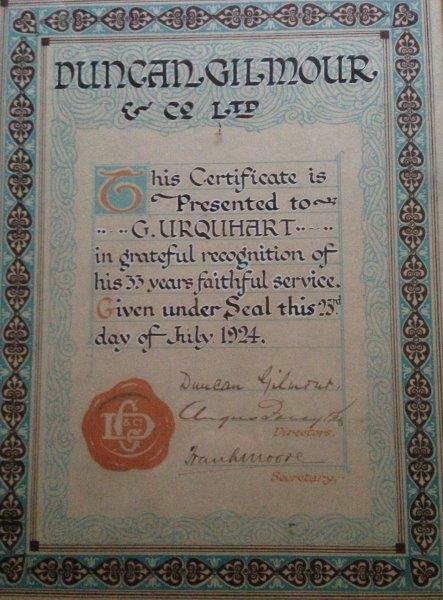 In July 1924 George Urquhart retired from Duncan Gilmour Ltd after 33 years service. Supported by his wife and family they became proprietors of the Punch Bowl Hotel Crookes, and whilst building a very successful business they were able to maintain and build up their many interests, especially in the piping circles and Caledonian community events. 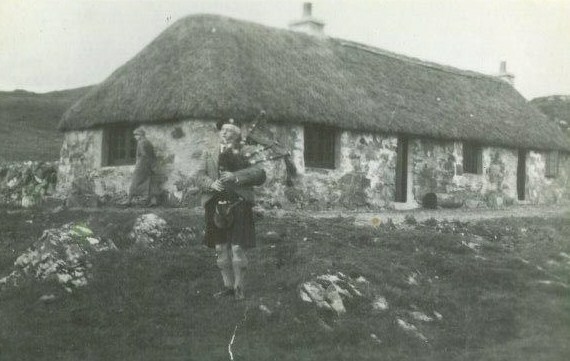 In July 1930, George and his wife decided on retirement from business and a move back to Scotland. 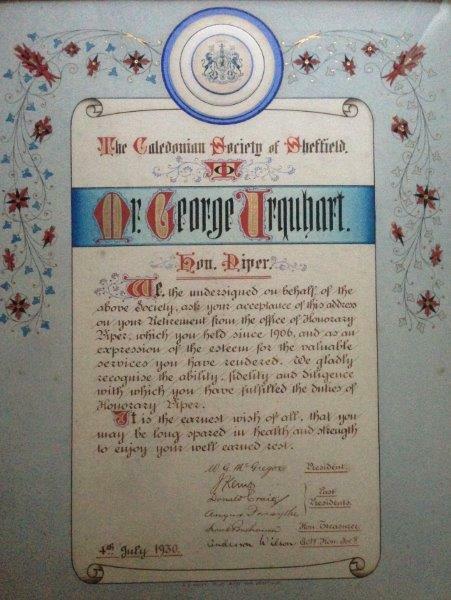 The Sheffield Caledonian Society honoured him for his 24 years as their honorary piper. During their all too short but eventful retirement many of their Sheffield friends visited their home on the shore of Lochalsh. George kept up his piping and indulged his love of fishing. He piped his son, George and daughter Maggie at their respective weddings and returned to his fluency in the Gaelic language. 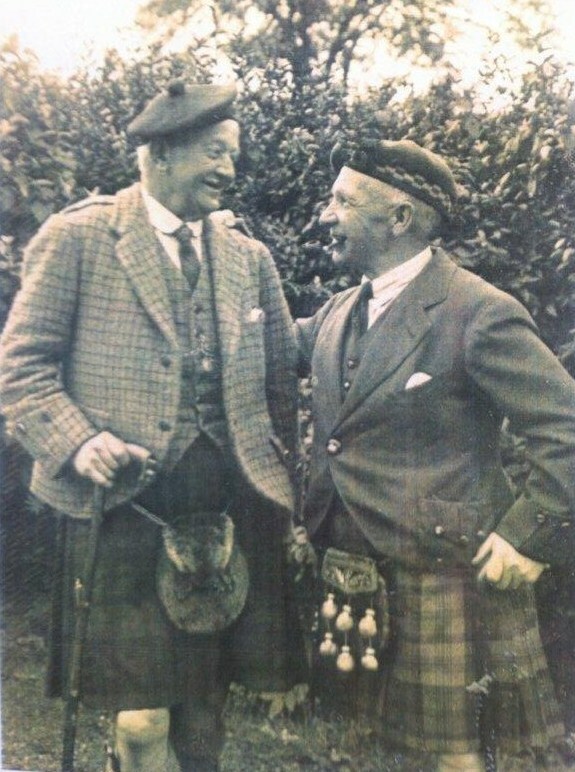 Sir Harry Lauder a long standing friend now retired from his music hall career was a regular visitor, especially for the fishing. But this idyllic life came to a premature end with blood poisoning from lead painting his beloved boat ‘Miss England’. George died aged 64 on the 24th June 1939 and was buried in the family grave in Kirkton nearby to his home. His wife Fanny later returned to her Sheffield roots, she experienced another wartime in the city but lived on to be 86. She died in 1959 as part of her daughter Maggies family. George Urquharts family now spread to Canada, New Zealand and Australia but are still well represented in East and Wester Ross as well as North Yorkshire. 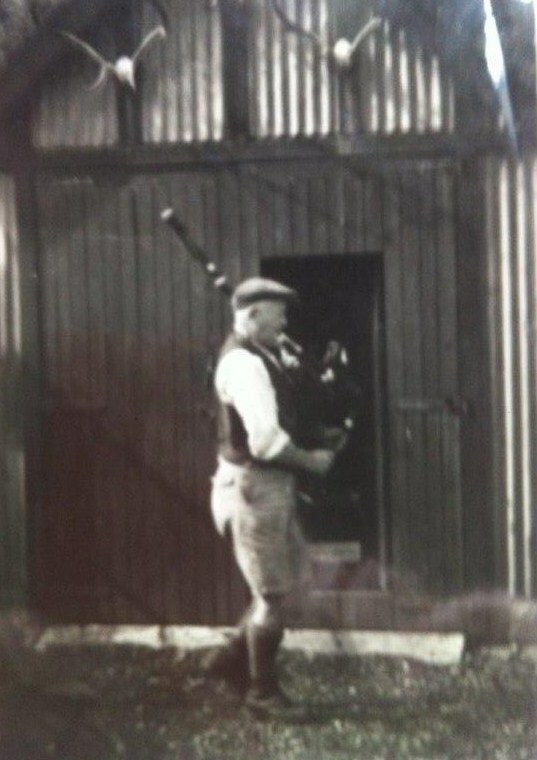 Special thanks must be made to Ian Hall, the grandson of George Urquhart and his family for the information and support they provided in producing this history of the bands first Pipe Major and founder.